In the middle of 2017, No Man’s Sky players discovered an ARG called Waking Titan, which featured a series events leading up to the release of the Atlas Rises update in August. The ARG closed following that, but it reopened in December, and now players are starting to receive items in the mail tied to the newly-begun phase four. Check out the best sandbox games on PC. 1.5 obviously sounds like a version number, and it’s a format in keeping with previous No Man’s Sky updates – except that there’s yet to be a version 1.4. Updates have typically been separated by a few months, so we’re about due for the next one if the schedule holds. The theories, then, go two ways: either 1.4 is due for a surprise launch very soon, or 1.5 will be such a substantial, “phoenix”-like rebirth of the game that they’re skipping version numbers. The 1.3 Atlas Rises update was the most substantial change to the game yet, and Hello Games said it was a “first step” toward building synchronous co-op, which was one of the features players were most disappointed to find absent from the original release. Some players have taken it on themselves to build the No Man’s Sky we dreamed of way back at E3, but a steady stream of official updates seem to be slowly lifting the game away from the disappointment surrounding its release. If you want to know where this ARG is going, keep an eye on the NMS subreddit. 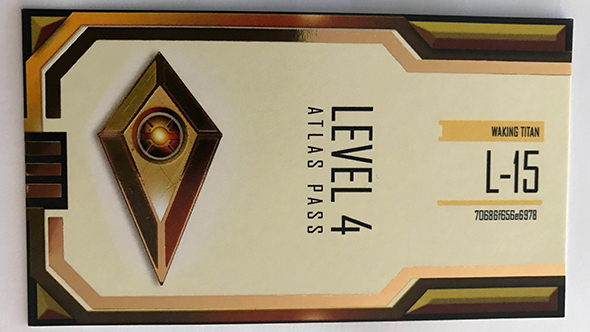 They’ve got a megathread going for recipients of the Atlas Pass, and you can be sure the power of the crowd will ultimately decipher the next step.